Killing the Lord Ruler to end the Final Empire was obviously the right thing to do, wasn't it? With the return of the lethal form of the ubiquitous mists, increasingly heavy ashfalls, and even more powerfull earthquakes, Vin and Elend are no longer so sure. Long ago, Ruin -one of the primal beings who created the world- was promised the eventual right to destroy all things. Now that Vin has been tricked into releasing him from the Well of Ascension, Ruin apparently intends to collect. 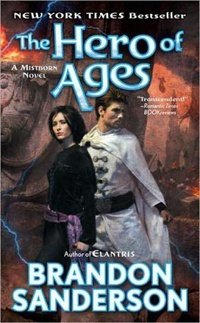 The conclusion of the Mistborn trilogy fulfills all the promise of the first two books. Revelations abound, connections rooted in early chapters of the series click into place, and surprises, as satisfying as they are stunnig, blossom like fireworks to dazzle and delight. It all leads up to a finale unmatched for originality and audacity that will leave you rubbing your eyes in wonder, as if awaking from an amazing dream.